PARIS, France, December 4, 2015 (ENS) – “The many thousands of governors, mayors, companies and investors who have so publicly committed to climate action are telling governments that our job in Paris is a climate change agreement that opens every possible door to help them push further and faster ahead,” said Laurent Fabius, president of the Paris COP 21 UN climate change conference and French foreign minister. 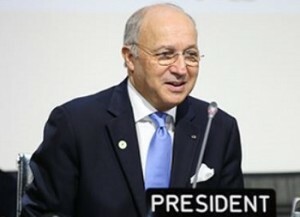 Fabius is talking about a report by Yale University released today in Paris which underscores the rapid speed, breadth and depth of the growing alignment between government, cities, business and civil society in support of a new, universal climate change agreement that unlocks faster progress towards a low-carbon, resilient future. The report by Yale’s Data Driven Environmental Solutions finds that the combined greenhouse gas emission reduction commitments recorded in two UN-backed platforms by cities, regions and companies surpasses the total emissions of the entire global iron and steel sector. Released on the eve of the UN climate conference’s Action Day-COP21 on on December 5, the report also finds that 15 of the world’s 20 largest banks totaling close to $2 trillion in market value have made commitments to act and green bonds worth close to $50 billion are financing climate projects. Fabius says the Yale report’s findings understate the scale of total global climate action because they are based on data from only two platforms supported by the United Nations, France and Peru, where national, regional and civic governments and business publicly enter their commitments to take action on climate change. “It is evident that this wonderful set of recorded climate actions is only a part of much wider, broader action towards a sustainable future. I know there are many tens of thousands of other climate initiatives out there and I welcome all who can to put their efforts, pledges and commitments on the record with us,” Fabius said. Yale analyzed over 10,000 climate commitments made by cities, regions, businesses and investors, many involving the cooperation of national governments, who formally recorded their pledges in the Non-State Actor Zone for Climate Action, NAZCA, and under the banner of the Lima-Paris Action Agenda, LPAA. At COP21, leaders of dozens of LPAA cooperative initiatives announced new commitments and many new cooperative initiatives are being launched. At the Action Day on December 5, government leaders, including French President Francois Hollande, CEOs and film makers will speak to this exceptional global response to climate change and underline the need to press ahead as quickly as possible. The growing wave of worldwide action by non-state actors to reduce emissions and make societies and economies resilient to climate change was matched ahead of the Paris conference by an unprecedented response from governments. So far, 185 developed and developing countries, together representing a footprint of almost 95 percent of global greenhouse gases, have submitted their national climate action plans to the secretariat of the UN Framework Convention on Climate Change (UNFCCC) as their contribution to the new agreement. “Indeed climate actions both outside and inside NAZCA bring a potent and powerful package of solutions to support a successful COP-21 Paris outcome and a way of transforming the INDCs into reality on the ground,” she said. • In all, 1,268 commitments from 1,192 cities and regions contribute 2.7 gigatons of carbon dioxide equivalent (Gt CO2e) in emission reductions. • One-hundred and eleven Global 500 companies with a collective $6.7 trillion market capitalization are making reduction pledges on NAZCA, contributing nearly 80 Million tons of Scope 1 and 2 CO2e reductions. • The total mitigation potential of all of NAZCA’s private sector actions (1,790 commitments) could be 10 times greater than that, since the Global 500 companies make up approximately one tenth of NAZCA’s private sector commitments. • 2,044 cities and 116 regions, including all those making individual commitments plus the 23 percent of the Covenant of Mayors’ cities represented on NAZCA, represent about 17 percent (1.26 billion) of the global population. • 97 cities out of the top 300 global cities by GDP PPP (Purchasing Power Parity) are engaged on NAZCA, with a total GDP PPP close to $20 trillion. • More than one-third (609) of the 2000 largest companies by Forbes 2000 (2014) across the globe are engaged on NAZCA. • These 609 companies represent aggregate revenue of $19.2 trillion, equivalent to the combined national GDPs of China, Japan and Germany in 2014. • 385 public companies on NAZCA with revenue data from Bloomberg have total revenue of $2.86 trillion USD. • About 15 percent of all individual commitments include a carbon price. Companies and investors make the majority of carbon price commitments, accounting for a total of 767 of the 770 carbon price commitments on NAZCA. In Doha in 2012, the Conference of the Parties serving as the meeting of the Parties to the Kyoto Protocol adopted an amendment to the Kyoto Protocol, which establishes the second commitment period under the Protocol.